We’ve been married since 1999. This year we’ll celebrate 14 years of marriage. (How is that even possible?!) And I look forward to many more decades of living with and loving Robert, my Mr. Incredible. Here are some of the reasons why I love him. 1. He makes me laugh. I’m serious by nature, and Robert’s humor and sense of fun add quite a bit of enjoyment to my life. 2. He loves me when I’d characterize myself as unlovable. His love is deep and enduring and doesn’t waver even when I act like the world’s biggest jerk. He just hangs on tight and loves me in spite of myself. 3. He’s reliable. Two months ago, I found out that I have adult ADHD. Which explained a lot. I really count on and appreciate Robert’s reliability. He remembers and takes care of not only his responsibilities but also helps me keep track of min. 4. He’s patient. He tells me that he doesn’t have much patience, but I live with the man and can safely, and factually, contradict that statement. 5. He’s a hard worker. 6. He’s supportive and encouraging. If he knows I’d like to do something, even if it’s a tad crazy, he works to give me the opportunity to fulfill that desire. Case in point: Rochelle Riley, a journalist friend of mine, had a celebration/fundraiser on 12/12/12. She invited me to come. She lives in Detroit, MI; I live in eastern NC. I have 5 kids ages 10 and under. I’d have to leave them for 2 days AND travel by myself. Despite his deep reservations, Robert let me go. This isn’t the end of the list. I’ll be adding to it on a regular basis. I’ve found that how I think about my husband becomes the lens through which I view him. So listing the reasons I love him is a good way for me to keep thinking loving thoughts about him. Then those loving thoughts become loving actions, and our bond is strengthened. What could be sweeter? 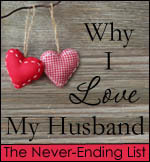 This post was inspired by the first “Why I Love My Husband” link up party over at The Happy Wives Club. Click the button to read other wives’ stories of why they love their husbands. Loved this line, “I’ve found that how I think about my husband becomes the lens through which I view him.” So very true! Thanks for linking up and I look forward to seeing your list grow. Hope to see you linking up against next week. Thanks for hosting the link-up party, Fawn, and for encouraging us to write down what we love about our husbands. I like the idea of adding to my list on a regular basis. Great post, my friend! I’ve found that setting out the reasons I love my honey really makes me appreciate what I have in him. The beauty is that there’s always something new to add to it. Congrats on your upcoming anniversary, and here’s to many more! Thanks, Bev! I absolutely agree that listing the reasons I love Robert makes me more aware of all that he does and gives me even more reason to love him. 🙂 Thanks for the congrats and well wishes. I’m glad you found yourself a keeper, and I wish you guys many happy years together.